avocado salad | What about this? 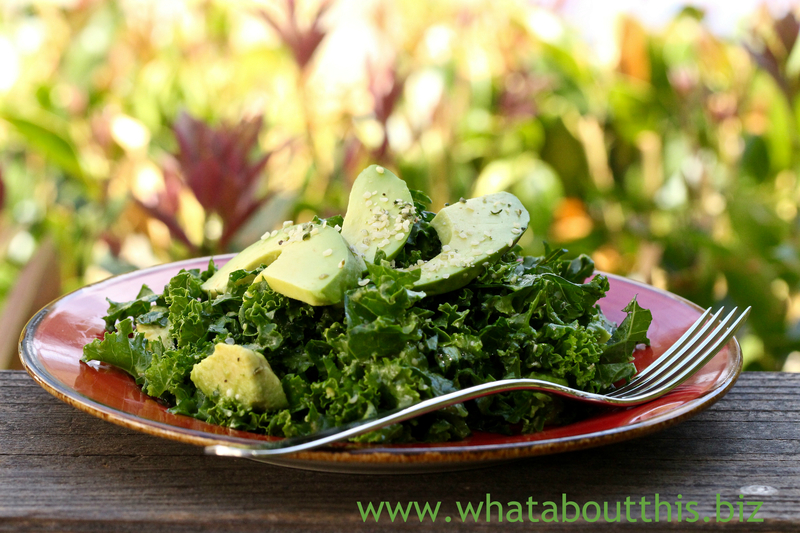 Bits of dark leafy kale combine with chunks of creamy avocado for a super nutritious salad. But wait, there’s more! Toss this salad with a fresh homemade citrus dressing and top it with a generous scoop of nutty-flavored hemp seeds. This lovely green salad proves that eating healthy can be simple and delicious. 1. Whisk together orange and lemon juices, soy sauce, and garlic in a bowl. Slowly whisk in oil; set dressing aside. 2. Cut 2 avocados into 1/2″ cubes and thinly slice the remaining avocado. 3. Put cubed avocados, half of the hemp seeds (if using), and kale into a serving bowl. 4. Toss kale mixture with dressing and season generously with salt and pepper. 5. Divide salad among plates and garnish with sliced avocado and remaining hemp seeds. 1. When tossing the salad, do not pour in all of the dressing in at one time. Pour a little bit in at a time and toss until the greens are lightly coated. You will have leftover dressing.